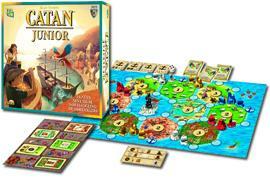 • Catan Junior is for families with children ages 6-9. Simplified building rules, child-oriented trading, and a more innocuous robber equivalent called the “Ghost Captain” provide access to the world of Catan games. • Skills: Some tactical and strategic thinking, although less than in the original “Catan.” Needless to say, luck plays a role too. • Catan Junior takes families with children ages 6 and up to a place quite different from Catan as we know it. There are no "settlers" around here. Instead, the players slip into the role of pirates who build their hideouts - called pirates' lairs - all over the islands and set sail to find new places and build more pirates' lairs there.